Did you know that the Feast of Trumpets paints a prophetic picture of the Rapture of the Church? In this article, I discuss an amazing connection between the giving of the Ten Commandments and the Rapture as revealed in the Feast of Trumpets! This article delves into the historical background of the Feast of Trumpets. Next, it discusses the prophetic significance of this Holy Day. Finally, it looks at some traditions and customs associated with the “mo-ed” known as the Feast of Trumpets. The Feast of Trumpets (or Yom Teruah in Hebrew; meaning “Day of the Blowing of Trumpets.”), also known as the “Day of Remembrance,” occurs on the first day of the seventh month on the Biblical calendar. We first read about the Feast of Trumpets in Leviticus 23:24-25. The “trumpet” referenced in these verses is actually a shofar (i.e. a ram's horn). God gave specific instructions for observing the Feast of Trumpets. He mandated that it would be a day of rest in which they would do no laborious work. Also, it was a day for a holy convocation and for presenting offerings to the Lord. Furthermore, unique to this Holy Day was the blowing of trumpets to serve as a reminder. It is curious, however, that God never said what they were to remember. I would suggest that one of the things they were to remember is the manner in which God gave His Ten Commandments. Here's why. We read in Exodus, “There was a thick cloud on the mountain. Then a shofar blast sounded so loudly that all the people in the camp trembled... the sound of the shofar grew louder and louder, Moses spoke and God answered him with a voice... The Lord descended to the top of Mount Sinai and called Moses to the top of the mountain. 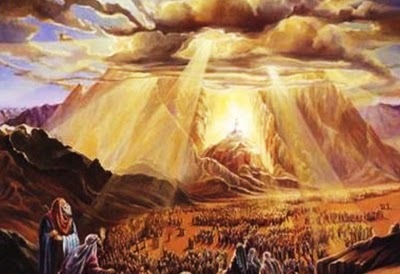 So Moses went up.” Amazingly, the events that took place at the foot of Mount Sinai are a perfect picture of the rapture, hidden in plain sight, in the Old Testament! Compare these events to the Rapture as described in 1 Thessalonians 4:16-17. The command to observe the Feast of Trumpets came less than a year after the giving of the Ten Commandments at Mount Sinai. 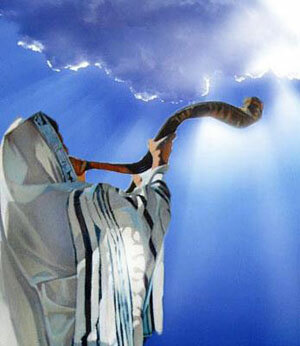 No doubt, the blowing of trumpets (shofars) would've been a vivid reminder of that most unforgettable day at Mount Sinai. Today few people use the Biblical name Feast of Trumpets (or Yom Teruah) and instead use the name “Rosh Hashanah” which literally means “head of the year.” Hence, Rosh Hashanah is commonly called the “Jewish New Year's Day”. The transforming of the Feast of Trumpets into Rosh Hashanah (New Year's Day) is the result of pagan Babylonian influence on the Jewish People. The Feast of Trumpets often fell out on the same day as the Babylonian New Year's festival known as “Akitu”. In time, the Rabbis “Judaized” the pagan Akitu festival by changing the name of The Feast of Trumpets to Rosh Hashanah (New Years). This is similar to the way the Church “Christianized” pagan celebrations giving us Christmas. But, that's a topic for another article. The Feasts of the Lord paint prophetic pictures of events some of which have already been fulfilled while others still future. The first four Feasts foreshadowed the crucifixion, burial, and resurrection of Messiah, and the onset of the Church Age. The Feast of Passover is a prophetic picture of Yeshua as our Passover Lamb, shedding His blood for our sins. Yeshua's crucifixion occurred on the Day of Preparation for the Passover, at the same time as the slaughter of the lambs for the Passover meal. Thus, His crucifixion fulfilled the Feast of Passover. The Feast of Unleavened Bread is a prophetic picture of Yeshua as the bread of life who came down from heaven to give everlasting life to all who would call on His name. Yeshua's body was in the grave during the first days of the Feast of Unleavened Bread. Thus, His burial fulfilled the Feast of Unleavened Bread. The Feast of First Fruits is a prophetic picture of Yeshua as the “first fruits of the dead.” Yeshua's resurrection was on the very day of the Feast of First Fruits. Thus, His resurrection fulfilled the Feast of First Fruits. The Feast of Weeks (Pentecost) is a prophetic picture of the great harvest of souls that would come into the Kingdom of God during the Last Days. On the very Day of Pentecost, just as Yeshua promised, God sent His Holy Spirit, fulfilling the prophecy of Joel. (Acts 2:16-21). In a manner reminiscent of the giving of the Law on Mount Sinai, God's Spirit gave rise to the Church Age. Thus, the birth of the Church on the Feast of Pentecost fulfilled Yeshua's promise of the gift of God's Holy Spirit. The Feast of Trumpets is the first of the three Fall Festivals (the Feast of Trumpets, Day of Atonement, and the Feast of Tabernacles). These festivals point to the Second Coming of the Lord. It seems that The Feast of Trumpets is a prophetic picture of the Rapture of the Church. But can we know when this momentous event takes place? Yeshua made it clear that no one knows the day and hour of His return. However, we can know when the time is near. Scripture passages such as the Parable of the Ten Virgins (Matt 25:1-13), and the Letter to the Church in Sardis (Revelation 3:1-3) let us know that it is the foolish and the spiritually dead who are caught unaware at His return. For them, His appearing will be like a thief in the night (see 1 Thessalonians 5:2). However, 1Thessalonians 5:4-6 tells us that we are not in darkness that the day of the Lord's returning would overtake us like a thief! We can know when His return is near; and it is indeed very near. And so knowing the times, it is imperative that we watch for, and are ready for His soon return (Luke 12:35-40). Blessed are You, oh Lord our God, King of the Universe, Who has granted us life, sustained us, and enabled us to reach this occasion. All these foods symbolize the hope of a sweet new year (Rosh Hashanah). On this Feast of Trumpets (Day of Remembrance), we ought to look back and remember how the events that took place at the foot of Mount Sinai point to the Rapture of the Church. In addition, we ought to look back to the binding of Isaac and remember how God, seeing the need, provided a (temporary) sacrifice. The God of Abraham, Isaac, and Jacob is our “Jehovah-Jireh” - the God who sees and provides. Yahweh, seeing our need, provided the perfect sacrifice in His Son Yeshua. Let us now rejoice in the knowledge that our names are permanently inscribed in the Lamb's Book of Life. On this Feast of Trumpets (Day of Remembrance), we ought to look forward with the jubilant expectation of Yeshua's (Jesus') soon return to take us to our heavenly home. Each of the first four Feasts of the Lord pointed to the First Coming of our Lord and Savior. Moreover, we know that Yeshua fulfilled each of the first four Feasts on the actual Feast days. Now, since the remaining three Feasts all point to His soon return, it's only logical to conclude that Yeshua will fulfill each of these Feasts on the actual Feast days. Though we cannot be dogmatic about it, the preponderance of Scriptural evidence suggests that the Rapture is most likely to occur during the Feast of Trumpets. It excites me to think how close we are to the day God's trumpet will sound, and we will be caught up to meet Him in the air. Maybe this will be the year when at last the Lord Himself will come down from heaven with a shout, (“Come up here” - Revelation 4:1), with the voice of the archangel, and with the trumpet call of God, and the dead in Christ will rise first. Then we who are still alive will be suddenly caught up to meet the Lord in the air. And so we will be with the Lord forever. Maranatha, come soon Lord Yeshua. Come soon.